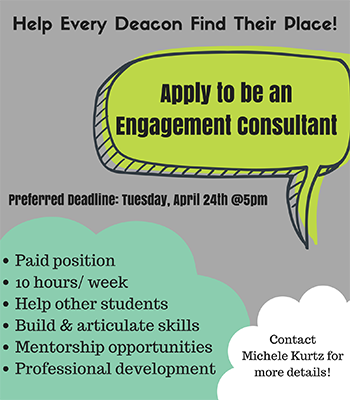 Engagement Consultants are students mentoring others who want to become more active on campus and find new friends or opportunities for growth. The preferred deadline for applications is Tuesday, April 24th at 5pm. Recommenders may include professional references, advisors, professors, coaches, past supervisors, etc. Applicants are encouraged to share the job description and their resume with recommenders. To meet preferred deadline, recommendation forms are due Thursday, April 27th at 5pm. All recommendation forms must be submitted no later than April 30th at 11:59pm. If you have any questions regarding the position or application process please contact Michele Kurtz at (336)758-4064 or kurtzms@nullwfu.edu. Nominate a student leader, organization or advisor for the 2018-19 SOAR Awards!